After a very slow spring, I finally logged some new LW/MW/AM stations. 📶 WCCM (0400 UTC June 14) on 1570 kc transmitting 140 W from Methuen, Massachusetts, 115 miles to the northeast. 📶 LW (0242 UTC June 28) navigational beacon on 402 kc transmitting from Lawrence, Massachusetts, 113 miles to the northeast. 📶 WRNJ (0400 UTC July 1) on 1510 kc transmitting 230 W from Hackettstown, New Jersey, 113 miles to the west-southwest. This logging was possible due to the shutdown of Boston's WMEX. 📶 WNRI (0500 UTC July 7) on 1380 kc transmitting 18 W from Woonsocket, Rhode Island, 80 miles to the east-northeast. 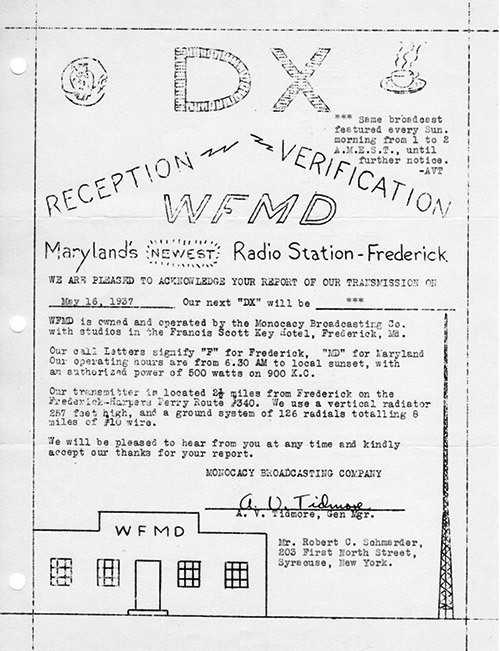 📶 WFMD (0500 UTC July 7) on 930 kc transmitting 2500 W from Frederick, Maryland, 282 miles to the west-southwest. All were heard on my ELAD FDM-S2/FDM-SW2 receiver and 80-meter inverted Vee antenna.